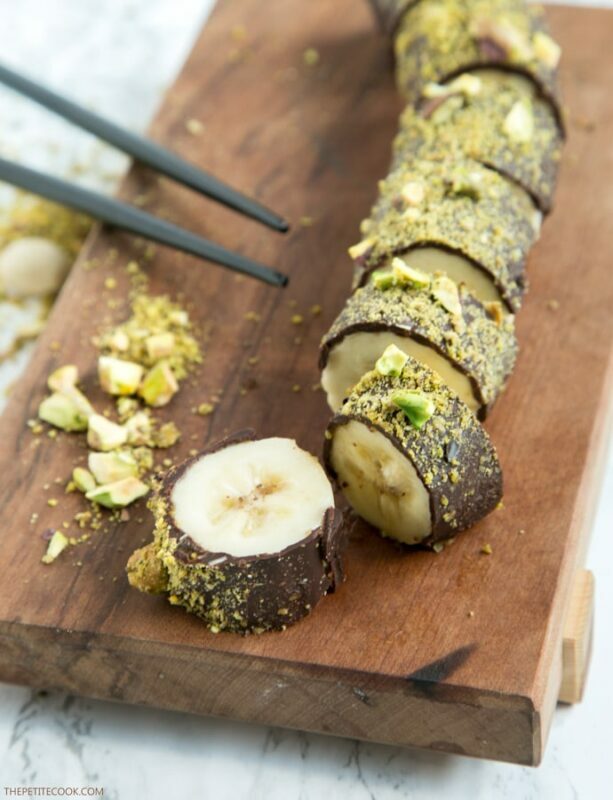 All you need is just 3 ingredients and 15 minutes to make this Pistachio+Chocolate Banana Sushi – This easy dessert is naturally gluten-free, dairy-free, vegan and totally kid-friendly! Where do I start? Once you try this Banana Sushi, you will wonder why you haven’t made it before! It surely has it all. It’s delicious, looks awesome and is totally good for you! Bonus point, kids love it too! This fun sweet “sushi” makes such a great party food and are equally great for a quick snack for you and the rest of the family. Seriously, how fabulous is that? 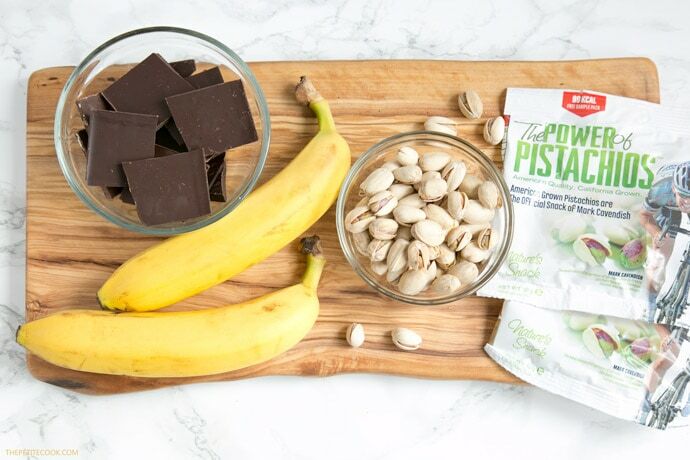 Healthy bananas covered with decadent dark chocolate and topped with crunchy, slightly salty protein-rich pistachios. 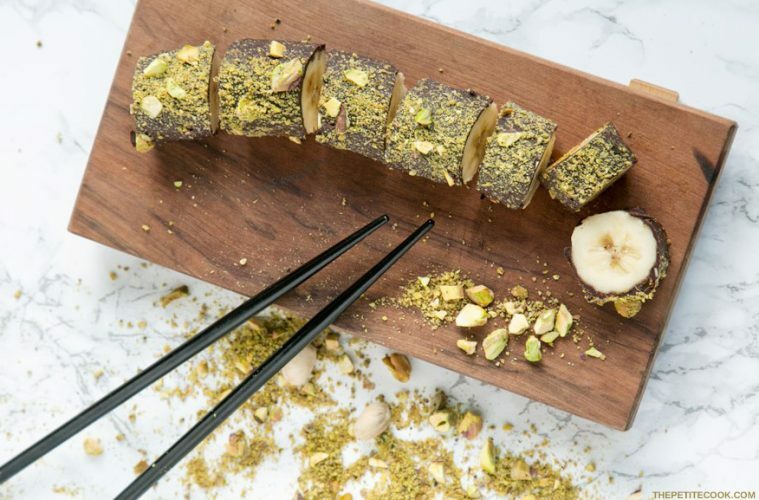 This Pistachio + Chocolate Banana Sushi is the ultimate sweet treat that is actually good for you. 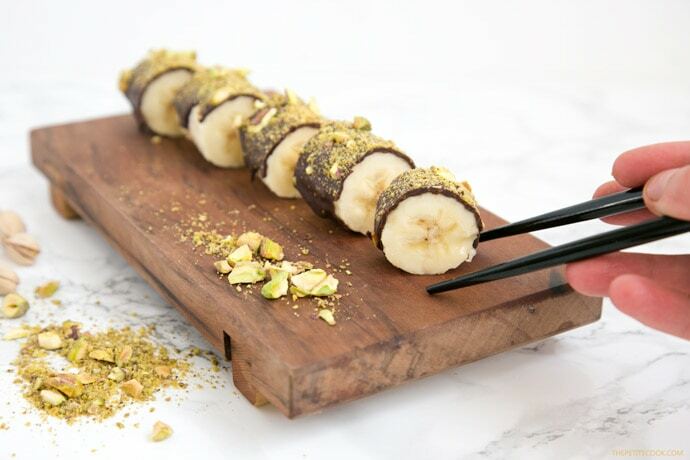 All you need to make this banana sushi at home is just 3 ingredients: banana, dark chocolate and delicious pistachios. I recommend using high-quality 72% dark chocolate, made with cocoa butter and cocoa beans and no additives. It’s super good for you and it will guarantee that your chocolate sticks well to the banana. Use bananas that are just perfectly ready to eat ( not the green or overripe ones). Don’t skip on the pistachio! I’m a huge fan of this superfood, it adds a lovely crunchiness and subtle sweetness to pretty much any kind of sweet and savoury recipe. I’m really proud to collaborate with American Pistachio Growers, which is a voluntary agricultural trade association representing growers, processors and industry partners in California, Arizona and New Mexico. 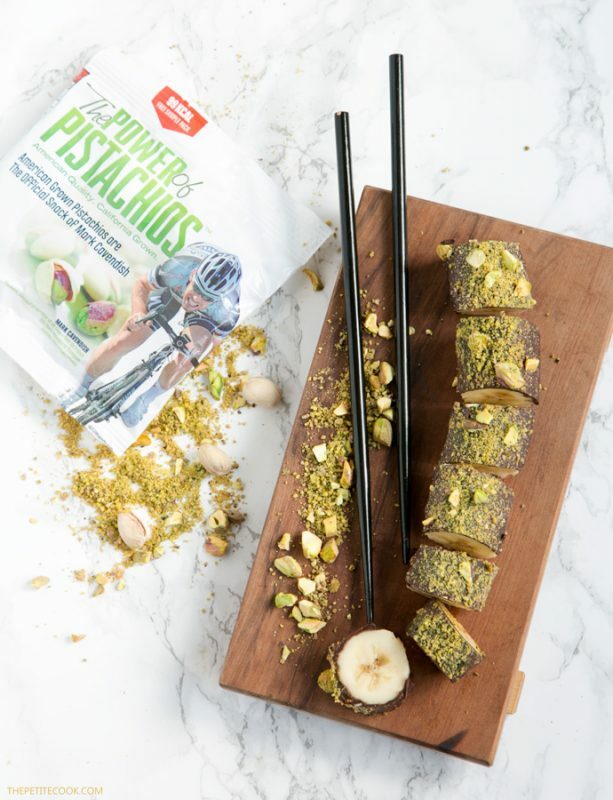 They take incredible care in growing, in a sustainable way, the best pistachios you can honestly find out there, and their core mission is to spread the word about the many health benefits of this super nut. Pistachios are powerful tiny nuts. They are a great source of many essential vitamins, minerals and fiber. Above all, they’re packed with protein, which contributes to the growth and maintenance of muscle. As part of my collaboration with American Pistachio Growers, I took their 10 and 2 challenge for 2 weeks, so I ate a small pack of pistachios at 10am and 2pm everyday. 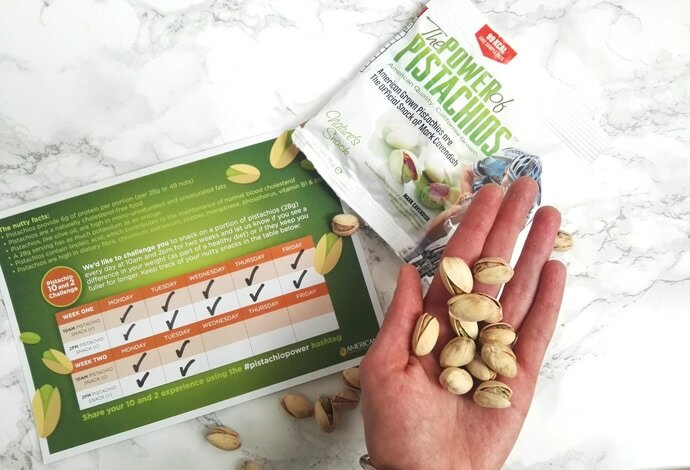 I can happily say that snacking on pistachios not only helped me having fewer cravings in-between meals, but it also gave me overall more energy. 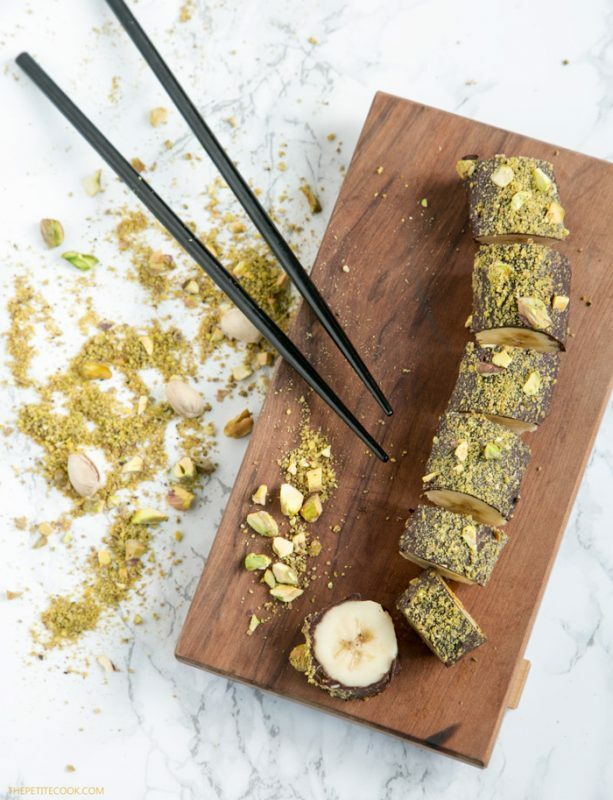 This awesome, delicious pistachio + chocolate banana sushi recipe takes literally no more than 15 mins to put together. Cover the bananas with melted chocolate (to avoid sticky chocolatey fingers, stick a toothpick at both ends of the bananas, so it’s easier to hold them while you cover them). Then sprinkle the bananas with chopped pistachios and put them in the freezer for a couple of minutes, to allow the chocolate to set. Once the chocolate is hard enough, cut the bananas into bite-sized sushi pieces with a sharp knife. That’s it, I promise it takes longer to read the recipe then actually making it! Plus, I’ve added my video tutorial to show you how easy it really is. 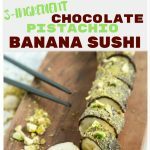 This Pistachio Chocolate Banana Sushi is SO pretty, fun and surprisingly simple to put together. Whether you’re serving them for a party, or simply looking for a healthy delicious snack for you and the rest of the family, this snack is a total success! This post is sponsored by American Pistachio Growers, and as usual, all opinions are my own. 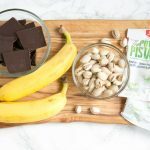 All you need is just 3 ingredients and 15 minutes to make this Pistachio+Chocolate Banana Sushi - This easy dessert is naturally gluten-free, dairy-free, vegan and totally kid-friendly! Peel the bananas and stick a toothpick at both ends, so it's easier to hold them while you cover them with chocolate. Cover the bananas with melted chocolate, then sprinkle with chopped pistachios. Put them in the freezer for a couple of minutes, to allow the chocolate to set. Serve on their own or with extra melted chocolate for dipping. Enjoy! HI Andrea, tried this once and the chocolate coating fell off when I started eating it. Did you have any issues with this? Hi Jack, oh no so sorry to hear that. What kind of chocolate did you use? When I’m making such simple recipes it all comes to very good quality products. I recommend you go for very good dark chocolate, which should list in the ingredients only cocoa, cocoa butter and a very tiny amount of sugar. Stay away from chocolate bars that cost less than £1, they maybe ok for baking, but not in such recipes. What chocolate brand(s) do you recommend for optimal nutrients? Loved the recipe btw!